We all saw it coming: the last official weekend of summer is here, along with a packed calendar of events. Savor the season with our list of fun places to eat and drink this week. Know others coming up? We do this every Thursday, so let us know, too. Stamford Pop-Up Farmers’ Market: Thursday, Sept. 3, 3:30 to 6 p.m. (rain or shine), Stamford Railroad Station, 21 Railroad Ave., Stamford. Stock your pantry and fridge with local groceries for the Labor Day holiday weekend. This market includes some vendors who don’t participate in regular weekly gigs, so you can find some new varieties of cheese, jam, maple products, meat, baked goods and other Catskill-produced food (vendor list here). Saugerties’ First Friday: Friday, Sept. 4, various downtown venues. This monthly event features special treats from local restaurants and bakeries along with great shopping, strolling and live music. This month, Black-Eyed Suzie’s Upstate on Partition Street debuts a fried chicken night: fried chicken, mashed potatoes, kale slaw and cornbread for $16, eat-in or take-out. Hudson Valley Dessert Co. on Main Street welcomes apple season with cider donut samples. Banana Moon Baking Co. sets up as a pop-up at Rayann’s Creative Instinct, 105 Partition St., serving cookies, brownies, fruit tarts and cupcakes beginning at 6 p.m.
Woodstock Farm Sanctuary Grand Reopening: Saturday, Sept. 5, 11 a.m to 5 p.m., 2 Rescue Road, High Falls. After a decade in Woodstock, the sanctuary has relocated to a 150-acre property in High Falls, and hosts a big public party to celebrate. There will be live music, arts and crafts for the kids and farm tours, including lots of chances to hang out with the chickens, goats, rabbits, sheep, pigs and other creatures who call the sanctuary home. Admission is free. It’s a great opportunity to sample inventive vegan fare from a large collection of food trucks rolling in from near and far, including Gone Pie Vegan Bakery, Cinnamon Snail and Yeah Dog. Phoenicia Flea: Saturday, Sept. 5 and Sunday, Sept. 6, 11 a.m. to 7 p.m. (rain or shine), the Maurice D. Hinchey Catskill Interpretive Center, 5096 Route 28, Mount Tremper. The artisan crafts and food market brings its Catskill and Hudson Valley wares to the grounds of the new CIC for one weekend only; read our story for more details. Music on the Mountain and Barbecue: Saturday, Sept. 5, 3 to 6 p.m., Plattekill Mountain, 469 Plattekill Road, Roxbury. The ski resort turns into a mountaintop cookout and concert venue, welcoming the rock ‘n’ roll band Talking Machine. The music is free; food and drinks are for sale, including Keegan Ales beers in take-home pint glasses. Bring a blanket or lawn chairs. Ski lift rides will also be running. 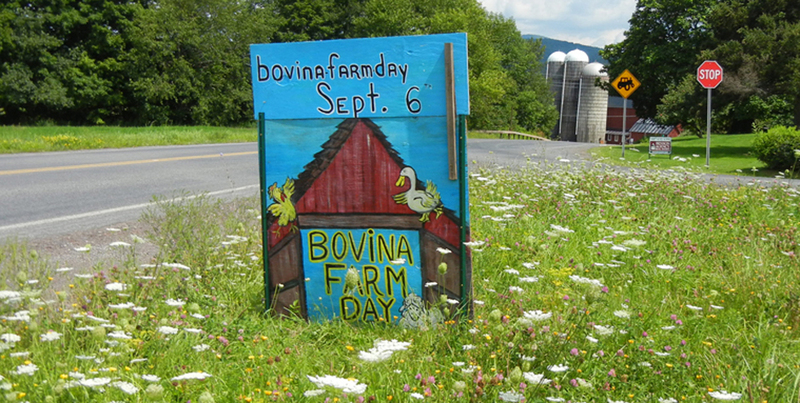 Bovina Farm Day: Sunday, Sept. 6, 10 a.m. to 5 p.m., Crescent Valley Road, Bovina. The seventh annual celebration put on by Farming Bovina features a day full of kid-friendly events, farm animals to meet, local foods to sample, and contests for apple-pie-baking and scarecrow-making. At 11:30 a.m., local chef and culinary instructor Gerard Murphy gives a cooking demonstration called “Celebrating Local Flavors” with a focus on lesser-used cuts of meat. At 2:30 p.m., Alex Wilson of Delhi’s Wayside Cider gives a short talk on “The American Apple.” Lunch will be available from Margaretville restaurant Summerfields. Admission is $5 per car.